We were at the right place at the right time this week when we rolled across the windy plains of Oklahoma into the small town of Pawhuska for the seventh time in nine months, excited to see if there was any progress on the Pioneer Woman Boarding House. 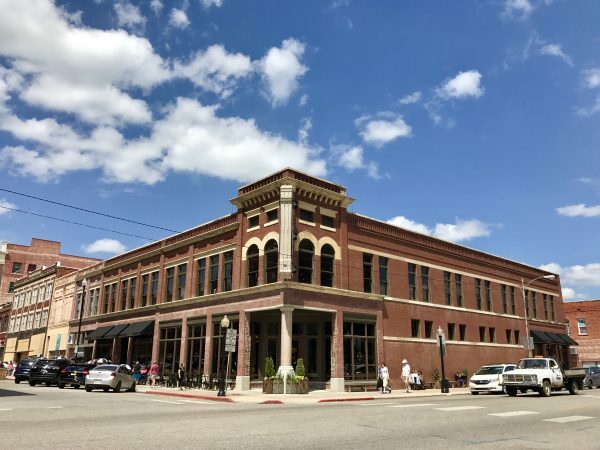 As you know by now, we adore this historic town that is coming back to life, in part due to the entrepreneurial spirit of The Pioneer Woman Ree Drummond and her husband, Ladd. We pulled into Pawhuska Wednesday and walked by the Drummonds’ new cowboy luxury hotel on our way to The Merc for dinner our first feeding. It wasn’t open yet, but the stunning lobby caught our eyes and we peeked through the door for a better look. One of the front desk attendants, Leslie, saw us and invited us in for a personal tour of The Pioneer Woman Boarding House. 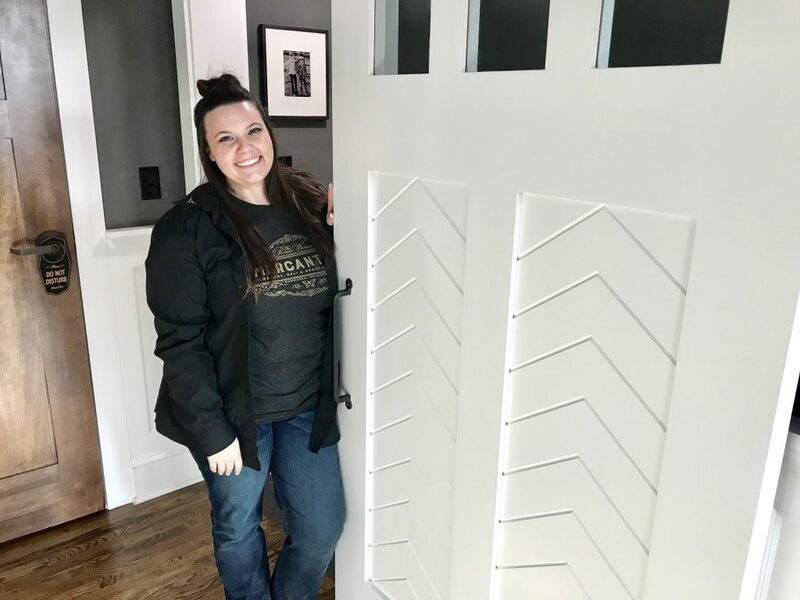 These swinging wood doors were original to the building and lead to the lighted themed rooms upstairs. The lobby is amazing — and it’s not even completed yet! 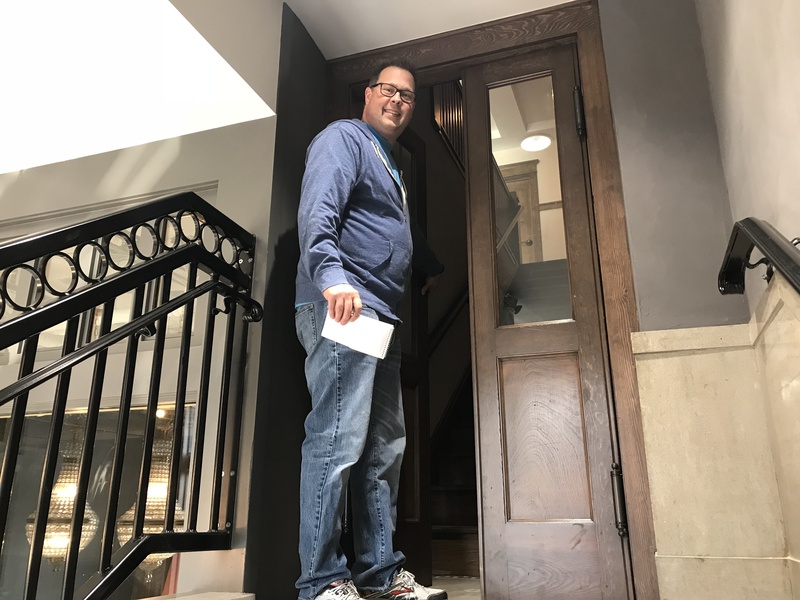 The Drummonds kept the original tile floor and also preserved the steps and swinging doors that lead upstairs. Constructed in 1920, Leslie told us the building originally housed the Indian Silk Shop and was later a clothing store and J.C. Penney department store. The sunlight coming into the Butterfly Room made the room so refreshing and relaxing. 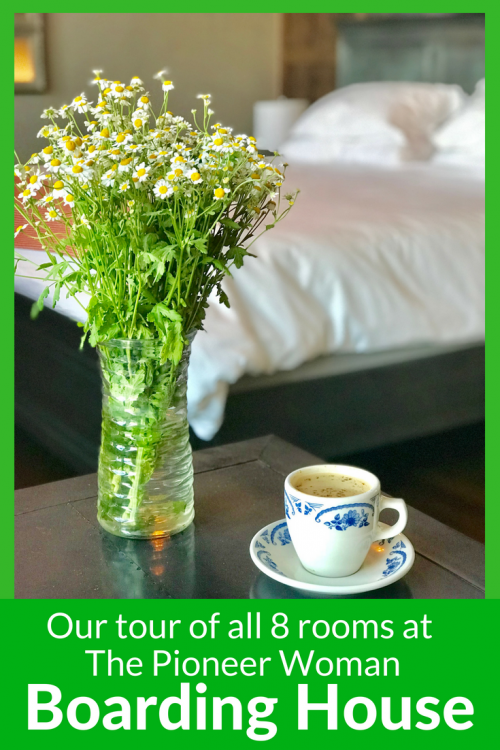 Each of the eight rooms has its own unique theme and name — Tack Room, Prairie Room, Ranch Room, Butterfly Room, and more. Leslie said Ladd designed the four rooms on the third floor while Ree created the four on the second floor. The Drugstore Suite was amazing! The uncovered mural, the apothecary jars, oh, my! The Drugstore Room was one of the first rooms we visited and I’ll admit our jaws dropped about as far as the time we first laid eyes on Ree’s chicken fried steak. It was incredible. 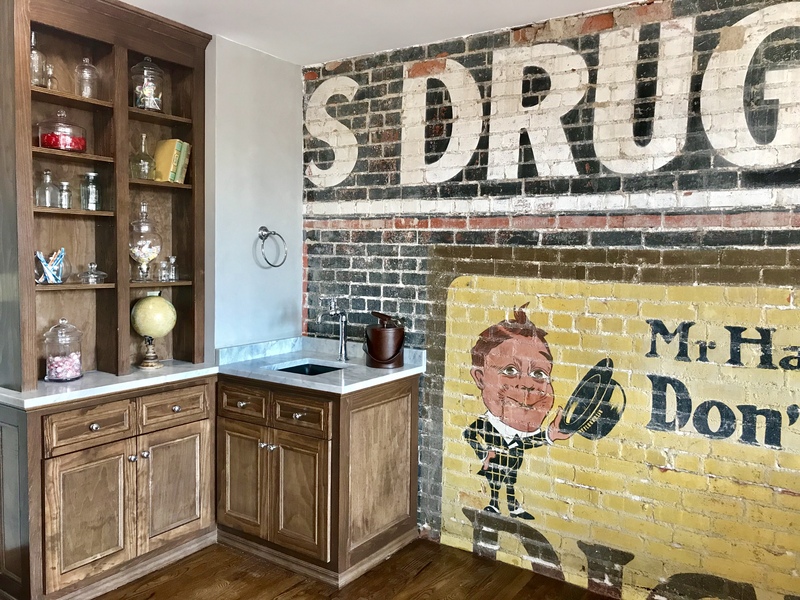 The largest feature of this suite is a huge Puryear’s advertising mural on the south wall. There are also wooden shelves that display apothecary jars filled with penny candy. Everything was just all so well thought out with careful attention paid to details that bring relaxation and luxury. 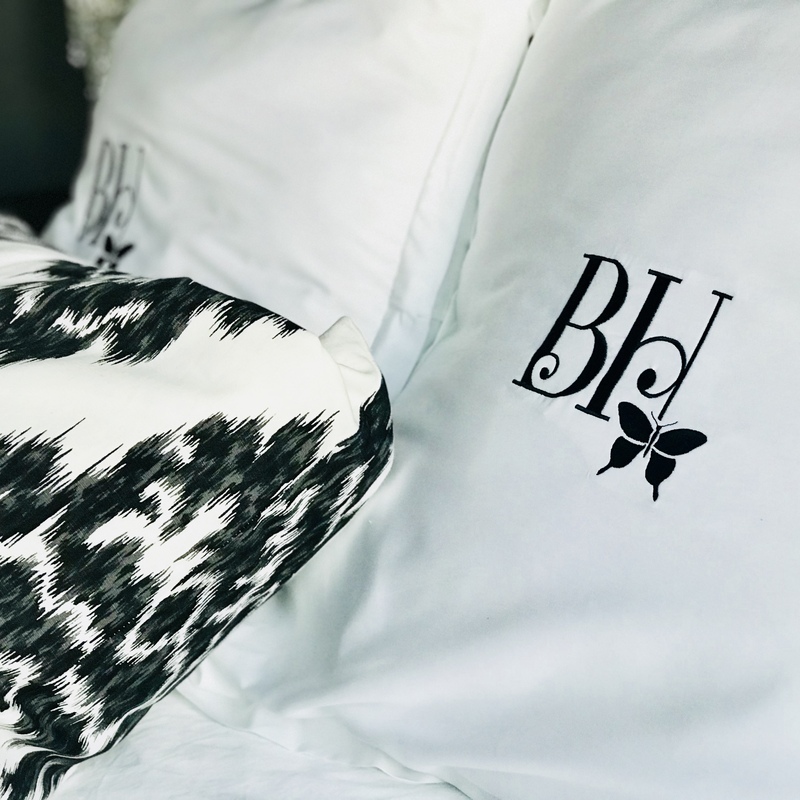 All of the beds have luxurious bedding with embroidered pillow shams. 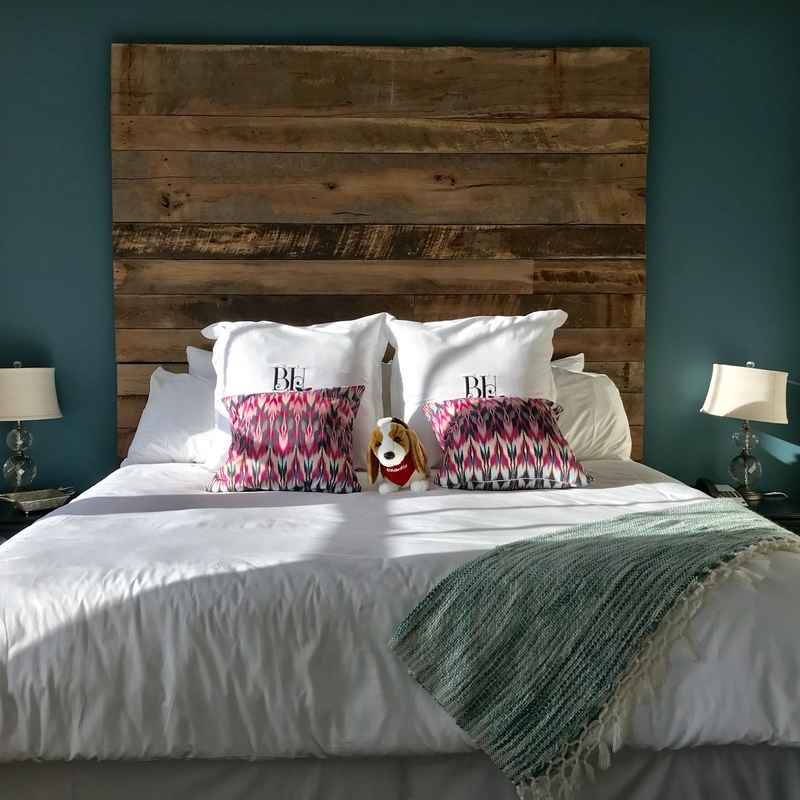 Each room has a king Tempur-Pedic bed topped with soft, fluffy bedding and decorative blankets. There is a stocked mini fridge and basket of unique snacks and fresh fruits in each room. In addition, they have provided not only a hair dryer, but a curling iron, as well. Sounds too good to be true, doesn’t it? 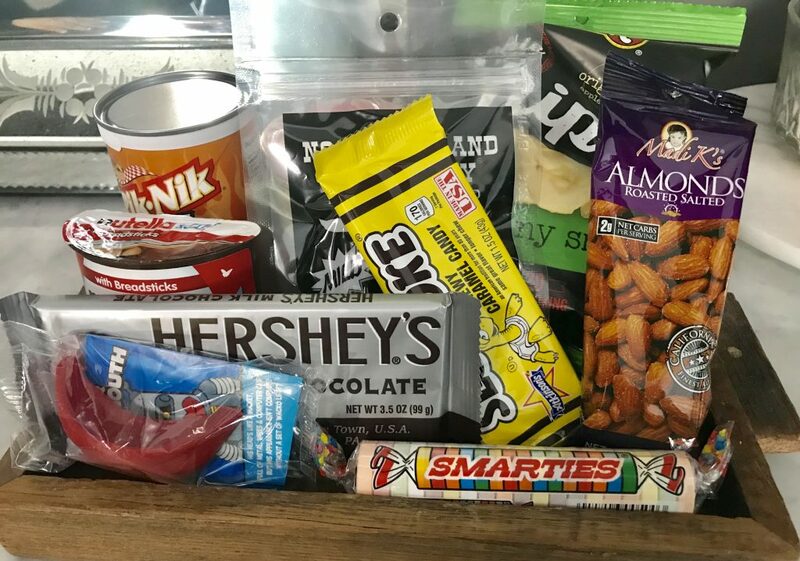 Each of the rooms includes a basket of fresh fruit and unique snacks (like wax lips and Smarties) for purchase. Oh, and bathing will be an experience at this hotel. The rooms have showers that are walk-in (many from both sides) and some have claw foot tubs. These aren’t the tiny, curl-up-your-knees and contort your body claw foot tubs, either. I’m talking stretch-out-your-legs, lie back in bubbles and soak-for-eternity claw foot tubs. The Boudoir is decorated in burgundy velvet and glossy black paneled walls. 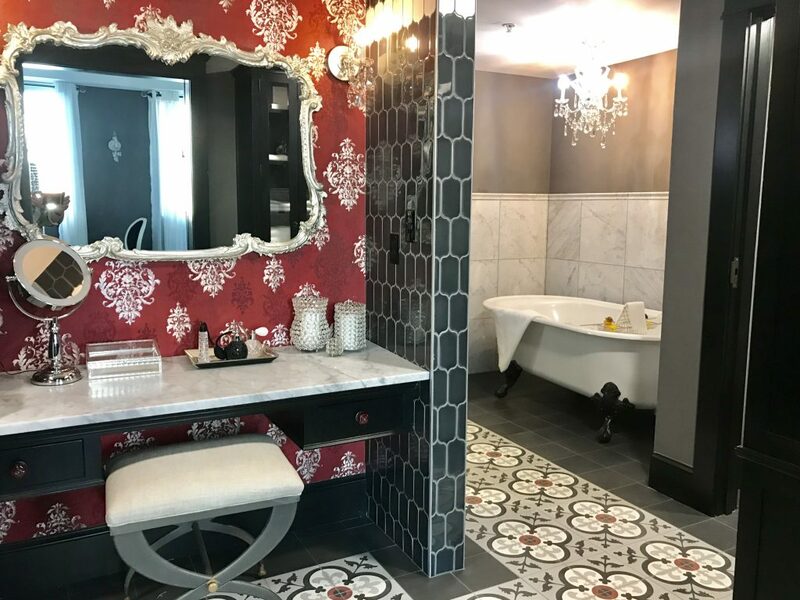 Can you imagine soaking in this claw foot tub with a chandelier hanging above? Every room was strikingly beautiful but the Emerald Room really caught my eye. 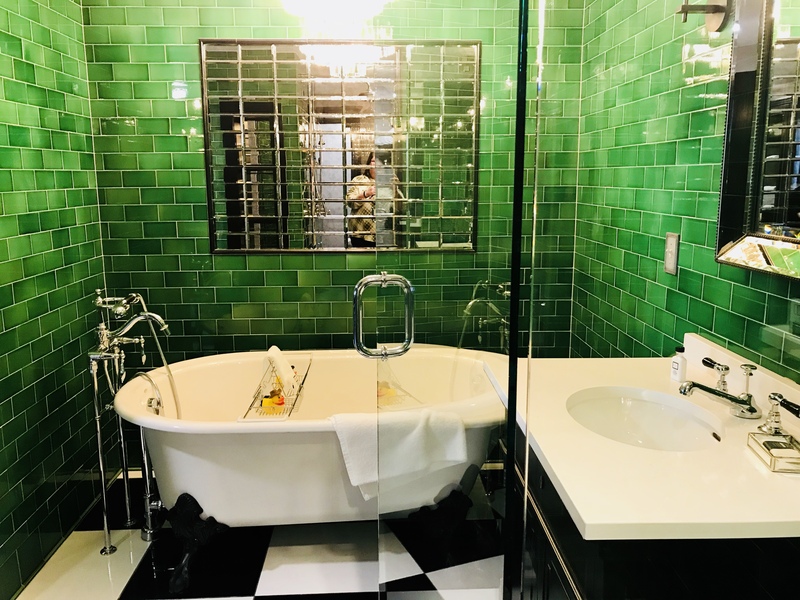 Featuring emerald green tile throughout the huge bathroom, this room just makes you feel like you’re in a completely different place and time. 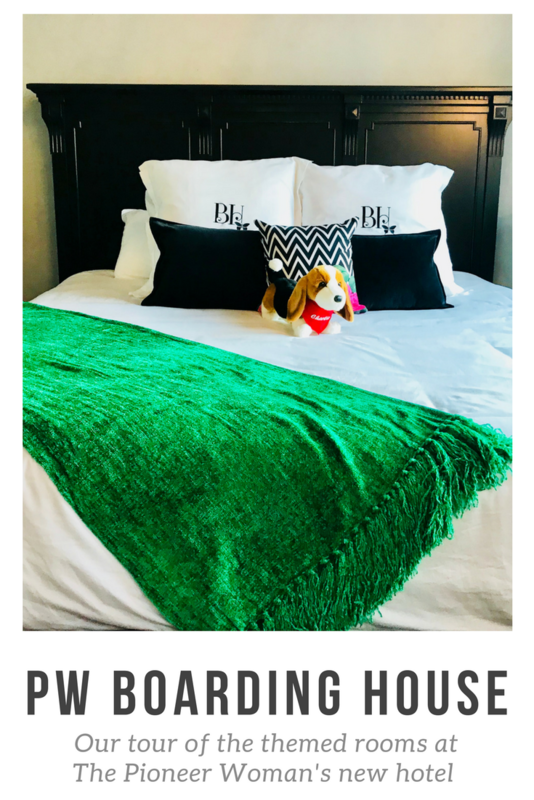 Each room at The Pioneer Woman Boarding House has luxurious bedding, and an accent blanket. This emerald green bathroom has a large claw foot tub in addition to a walk-through shower with floating glass doors. I know I’m in the reflection in the mirrored tile, but I just had to share a picture of this amazing room! I also loved the Photograph Room. 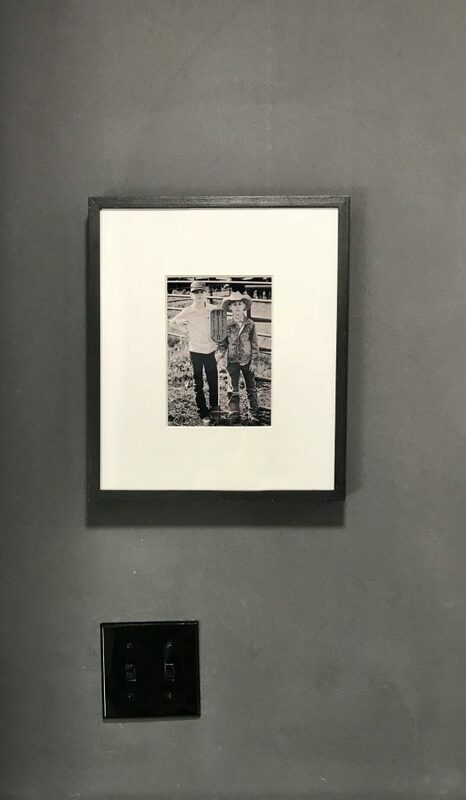 The charcoal plaster walls are decorated with stunning photographs from the Drummond ranch, all taken by Ree. The bathroom has marble countertops and the entire room is ADA-accessible. The Photograph Room is ADA compliant and filled with photographs taken by Ree Drummond. Everything in this ADA-accessible room is so well thought out. 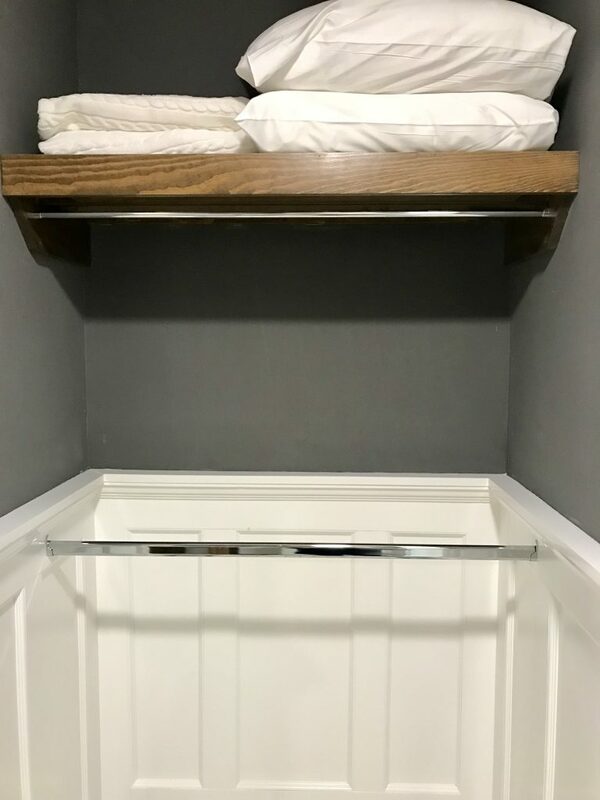 The closet is open and includes a lower bar for hanging clothes. The Photograph Room in filled with Ree Drummond’s photography. 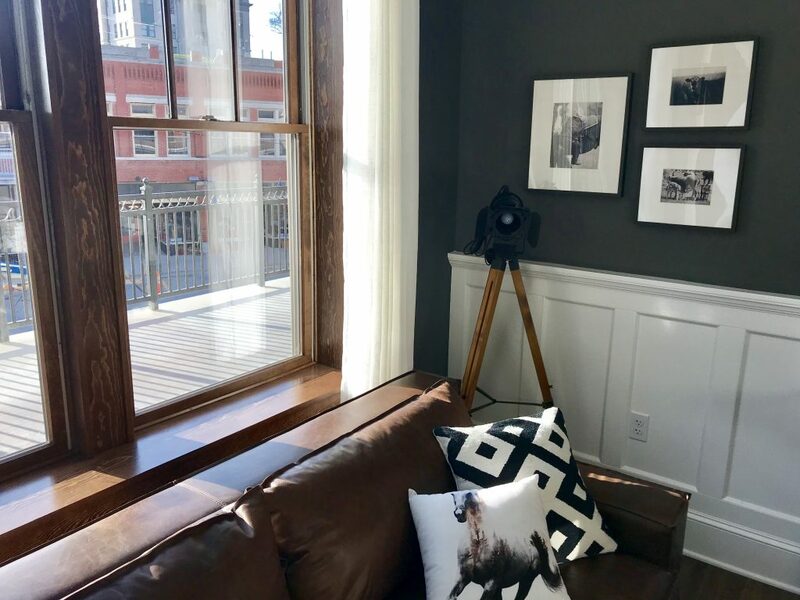 There’s no doubt in our minds The Boarding House is going to be a destination in and of itself for people who want to escape, relax, and unwind. Not only are the rooms and amenities some of the best we’ve seen in all our travels, the people who work there are committed to one thing – making people happy. Our tour guide Leslie, who is from nearby Hominy, was a wealth of information about the history of Pawhuska and Osage County. And like everyone we’ve met in Osage County, her gift of hospitality made us feel right at home. Our tour guide, Leslie, was so sweet and full of great information about the history of the town and the building. We can’t wait for The Boarding House to open and look forward to sharing much more about the additional perks and services provided to guests. The spicy cowgirl coffee delivered to your room. The outside terrace overlooking Kihekah Avenue. The wine reception. The turndown service each evening complete with chocolate truffles. We’ll share it all with you, soon. In fact, we’ve got a room booked the first week in May and we can’t wait to check in. Thanks again to everyone at The Pioneer Woman Mercantile and The Boarding House for your incredible hospitality. We can’t wait to check in. I was born at the old hospital in Pawhuska that used to sit where the new library is now! It’s a lovely town! My parents still live in the house I grew up in! Right next door to you across the street! I should come visit someday when I come home! The blue roof! Merry Christmas, to you as well! We’d love to get to know you sometime when you are here. Hey, hey Ann and Steve! 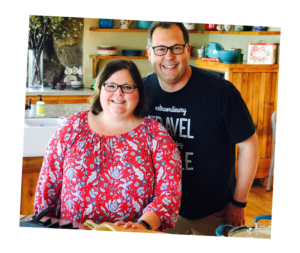 Leslie from The Pioneer Woman Boarding house. So sorry it has taken me so long to write you. I do not have an email for you so I decided to write you via comment on your blog lol Thank you so much for your lovely note during your stay and Im sorry I wasn’t there to see you! Hope all is going well in your lives! Good luck in your future trips, blog and life. Hope to see you again in Oklahoma! Thanks for writing us, Leslie! We’re sorry we missed you (we slept in) when we were at The Boarding House. You and everyone there have done an amazing job and we can’t wait to come back! Until next time, take care, and thanks for following along on our journey. 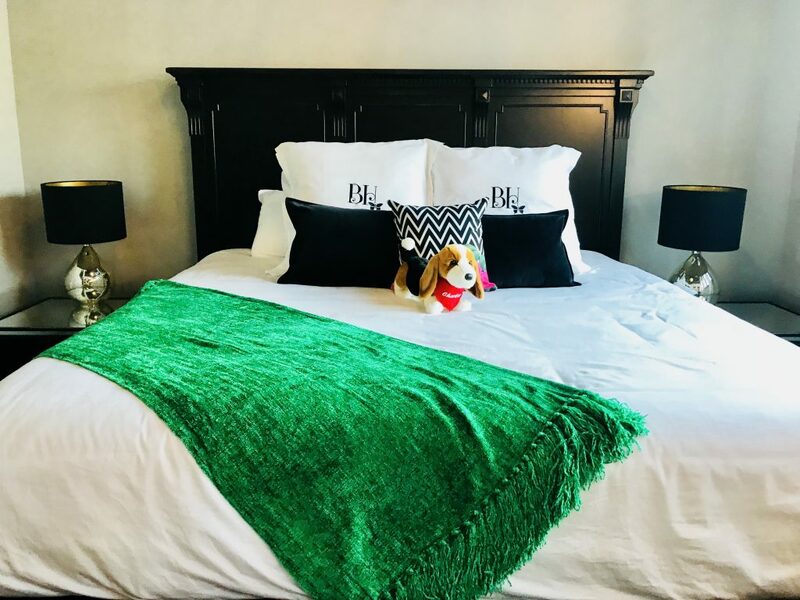 Hey, so I stayed at the Boarding House and I just wanted to let you know that one of your captions (under the picture of the stuffed Charlie on the bed in the Emerald Room) is incorrect. You said that in each room, there is a stuffed animal from the Mercantile on the beds, but that isn’t true. I was looking forward to that, but when we entered the room, I was disappointed that there was no Charlie. I just wanted to let you know that we asked the front desk about it (based on your review) and we got told that the stuffed animals were only set on the bed for pictures. They aren’t actually there when you get a room. Thanks for pointing that out. We have changed the caption so that it is correct. Other than no Charlie, how was your stay? My husband, Bill Butler, grew up in the apartments that were above the JCPenney store. We can hardly wait to go back and see the Boarding House. His mother worked at JCPenney and managed the apartments. The Drummonds have brought back the memories for sure. Please let us know if you visit the PW Boarding House. We’d love to hear what you think. Thanks for sharing your memories with us. Beauriful! Lucky you getting to see in person.. I just got a email showing all the rooms. Will have to check them this summer.???? We were very lucky. We had no idea it was so close to taking reservations and opening. We just happened to be in Pawhuska at the right time. We returned to Oklahoma to check on an apartment for our daughter in Tulsa and we’re attending the Pawhuska Chamber of Commerce Gala tonight. Can’t wait for you to visit, Mary! You’re going to love it.